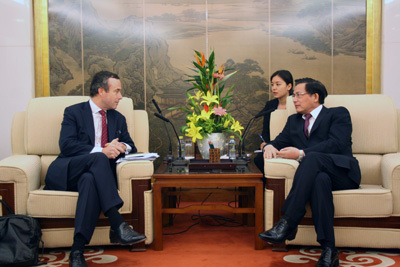 On March 23, 2011, Assistant Foreign Minister Hu Zhengyue met in the foreign ministry with the Financial Times Editor Barber. Hu extended welcome to Barber. He said that the coverage of the Financial Times about China in recent years has had important influence on the world's understanding of China and interviews with the Chinese leaders and publications of relevant articles have achieved good results. He hopes the Financial Times to introduce China to the world more completely and objectively so as to increase the understanding and cooperation between China and the rest of the world. Being asked, Hu also introduced China's position on such issues as resuming the six-party talks, China-US cooperation in Asia, China-India relations and the situation in Libya.